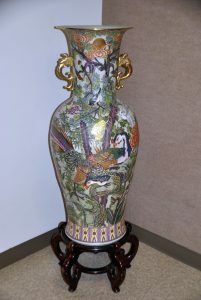 This Satsuma Style Peacock Vase, which is on permanent display in the hallway of the Gladys Woods Kemper Center for the Arts, is part of the art collection donated by the Ruthenbergs. Art donated to William Woods University by Janet and Don Ruthenberg will be on exhibit through Feb. 17 in the Mildred Cox Gallery. The show will include 25 pieces in a variety of media. Janet Ruthenberg, the former Janet Dee Payne, is a 1952 graduate of William Woods and her husband has been an honorary member of WWU’s Board of Trustees since 2009. Best known in mid-Missouri as the former president of Columbia College, he also has served as president of other colleges. A scroll donated by the Ruthenbergs is in a recently opened exhibit at William Woods. He currently is a consultant for higher education institutions in the U.S., Asia, and the Middle East in areas of English language development, student recruitment and faculty exchange. 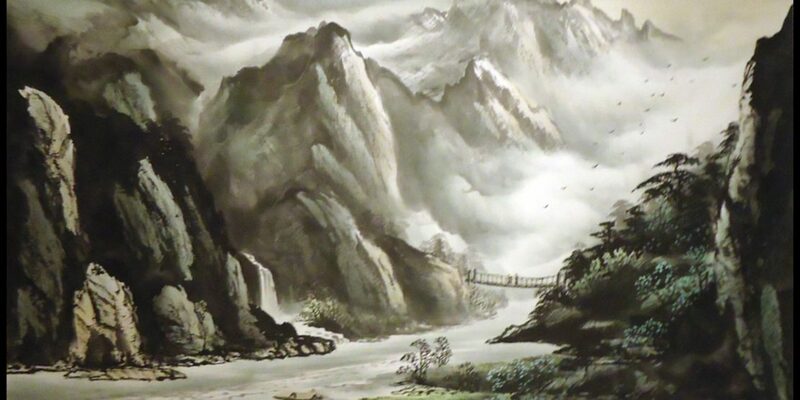 “Wanting to express our gratitude for the generous donation of Janet and Don Ruthenberg to our permanent art collection, I installed an exhibition called ‘Rolls and Scrolls,’” Nicole Petrescu, gallery coordinator, said.